About two years ago, Marc and I went on a date at Ava Gene’s — a “Roman inspired” restaurant here in Portland which is really freaking delicious. I remember nothing about what we had, EXCEPT FOR THE TOAST. Yes, we ordered toast at dinner. 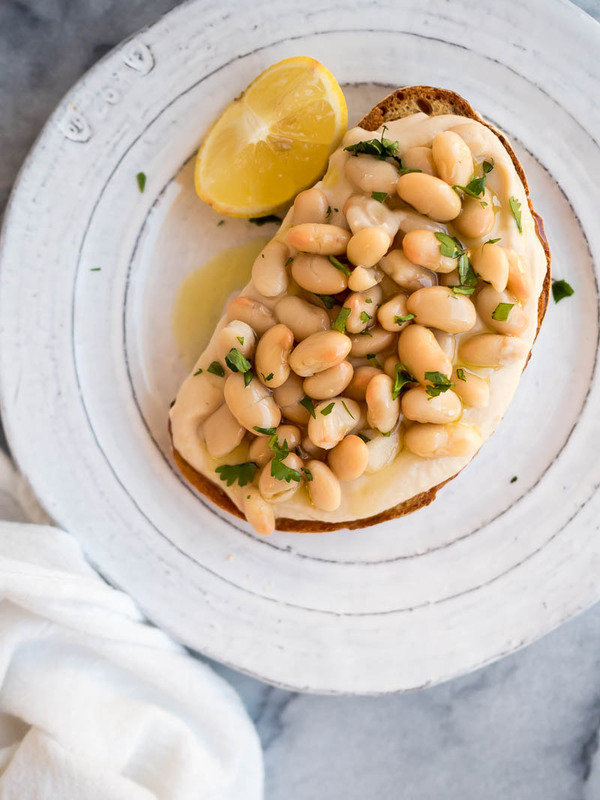 It had pureed beans, whole beans, garlic, oil, thick sliced bread — that’s about the extent of what I remember, other than the fact that I loved it. I’ve been thinking about it ever since, so finally decided to make it myself! I have no clue how they actually make theirs, other than what the menu says: “Borlotti beans, garlic, rosemary, lemon.” I had navy beans on hand, so I used those instead. I roasted an entire head of garlic, which was definitely a good decision. The lemon is ESSENTIAL — it gives the entire thing a zesty pop and brings it all together. Aside from the roasting garlic, this takes about 3 minutes to pull together. HIGHLY RECOMMENDED. I made a batch of the puree to keep in the fridge, then assembled these toasts all week (well, tbh it lasted like 2 days because I ate it all.the.damn.time. Woooops!). If you need a good bread recipe to put this on, I still make this no-knead bread a few times each week! 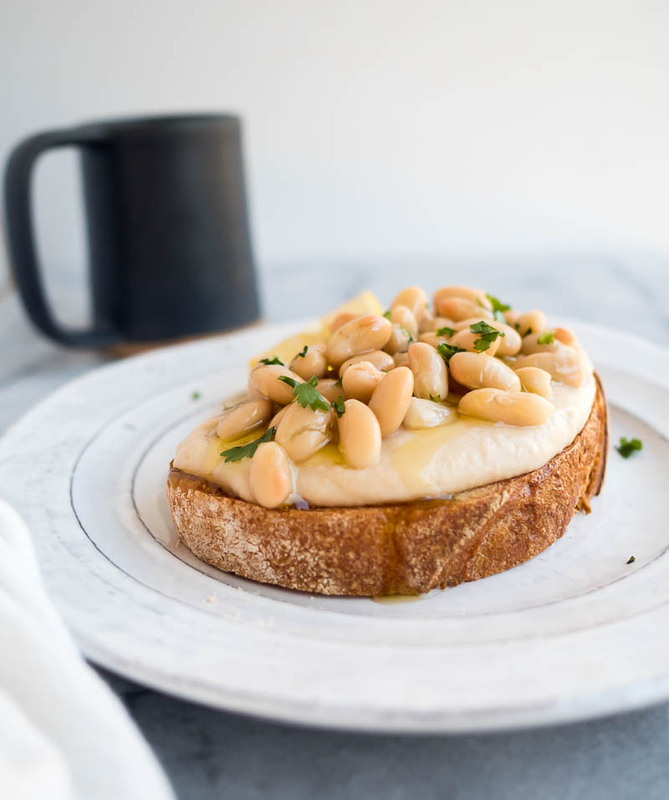 Roasted Garlic and white beans, along with lemon and olive oil, make this smooth and creamy toast a delicious, quick, healthy meal! When the garlic is done, squeeze the cloves out. Combine with the remaining olive oil, one can of beans, the rosemary, and lemon juice. Blend (I used an immersion blender) until extremely smooth. Add water, a very small amount at a time, as needed to achieve a smooth but not stiff texture. 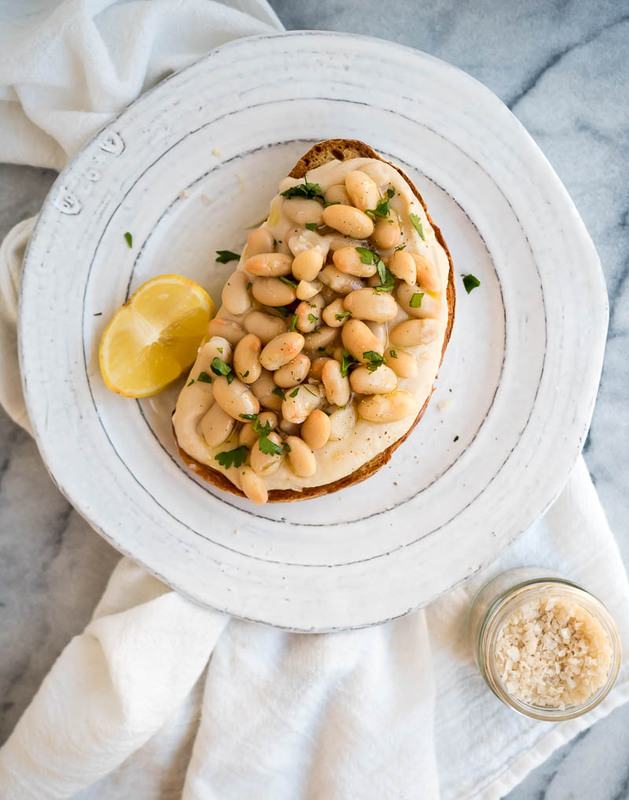 When you’re ready to assemble, toast the bread, spread a thick layer of bean puree on top, then add a layer of un-pureed beans. Drizzle with a small amount of olive oil, and add large flakes of sea salt and herb garnish if desired!